If you like these, spread the word, and send this URL to everybody! Thanks! 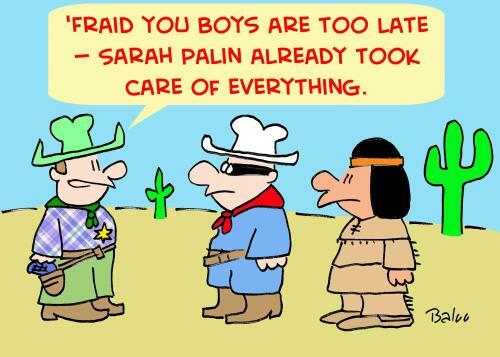 Now back to our regularly-scheduled cartoon…. This entry was posted on Wednesday, September 17th, 2008 at 7:54 pm and is filed under Uncategorized. You can follow any responses to this entry through the RSS 2.0 feed. You can leave a response, or trackback from your own site. THIS BLOG IS NO LONGER BEING UPDATED! CLICK HERE TO GO TO MY NEW, MORE COLORFUL, EASIER TO NAVIGATE CARTOON BLOG! All the cartoons on this site are copyrighted and it is illegal to use them in any way without permission. However, rights to use them in magazines, newsletters, websites, presentations, books, and all other media are available. To discuss rates for this.... Email Baloo! BALOO CARTOONS AND MERCHANDISE — T-SHIRTS, CUPS, PRINTS, ETC.